Under the Made for iPod programme, Creative have several products made specially for the iPod which includes speakers, Xdock, earphones etc. 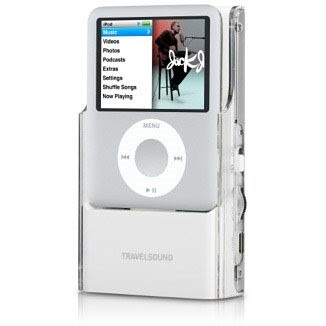 You can now purchase the TravelSound i80 (pictured above, for the iPod Nano 3rd and 4th GEN) @ US$79.95 and the TravelSound i50 (for the iPod Shuffle 2nd GEN) @ US$59.95. Personally, I think the i80 is the best looking TravelSound, but I simply can't bring myself to buy a Nano to use it. So if you already have an iPod Nano or Shuffle, head down to Apple's online store and grab these two awesome looking (and sounding) speakers before they are gone! Read Cnet's review of the TravelSound i80 here.